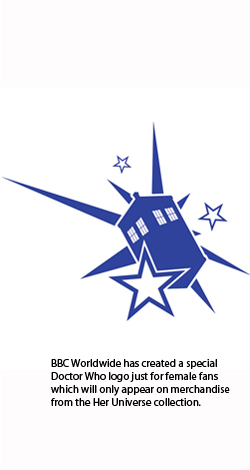 Ladies geek chic clothier Her Universe announced a deal with the BBC today that'll have the company taking a Tardis into your t-shirt drawer soon. Every sci-fi fan knows Dr. Who. The time-bending Doctor has been thrilling audiences with his adventures for a long, long time now. The licensing deal for Her Universe makes a lot of sense as the show really bridges the gap between fans an is almost as widely loved by female viewers as it is by the guys. Her Universe founder Ashley Eckstein has a great history with the genre too- she plays Ahsoka, the young Jedi partner to Anakin Skywalker, on the Clone Wars cartoon show. Is she just as excited about the new license as fans- I'd say so. "Her Universe is a line for the fans," said Eckstein. "Many of our design choices and decisions are influenced by our fans and Doctor Who was the #1 requested license by fangirls for us to pursue next. It was truly a dream come true when BBC Worldwide asked us to do their female merchandise and I am beyond excited to share this extraordinary announcement with our girls today! In the words of the Doctor, I feel like screaming Geronimo!"